Beerland’s opening limited release for 2019 focuses on delivering maximum seasonal refreshment in the form of a grapefruit gose. The peel from 150 hand-peeled grapefruit was added to the beer at the same time hops would be added if the brewers were dry-hopping with the intention to replace the traditional citrus character more commonly derived from coriander seeds. The peel's embellishment of the beer is subtler and more balanced than expected. In contrast, the salt is more pronounced than recent examples; perhaps that's the expression to be expected of the "ancient sea bed" salt flakes that were used, however, it’s difficult to say how prehistoric sapiens, or saltwater crocs for that matter, favoured their grapefruit goses. 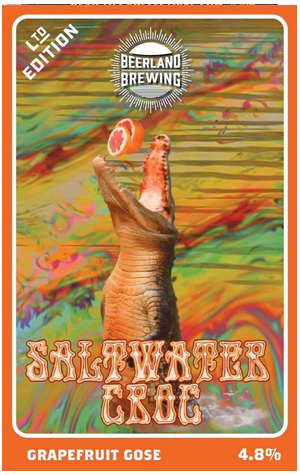 Nevertheless, it all coalesces with a short finish that demands repeat sips and, thanks to the ongoing warm weather, Saltwater Croc is perfectly timed for mid-summer drinking.